michael latour – Design Your Lifestyle. No matter how hot transitional kitchen design gets, there will always be room for classics – traditional design, culinary expertise, and La Cornue ranges and appliances. Peter Salerno Inc. – the most award-winning North American custom kitchen and bath design company of the 21st century – is a proud provider of La Cornue appliances through Purcell Murray. La Cornue creates classic looking ranges that even the most experienced professional chefs will enjoy cooking with. They mix different materials such as stainless steel, copper, and brass with fired porcelain bodies in a wide variety of colors. Because of their performance and timeless appearance they are a common feature in Peter Salerno’s Tesoro ™ Collection kitchens. Peter also features a functional La Cornue Chateau 120 range and Flamberge Rotisserie in its magnificent, award-winning showroom in Wyckoff, New Jersey. And why have these world-renowned appliances if you’re not putting them to good use? Peter Salerno Inc. hosted the exceptional Master Chef Michael Latour in its showroom to display the form, function and versatility of La Cornue appliances by creating a stunning multi-course meal. Our cameras were there to document the experience – trust us, this is well worth the watch! Michael Latour’s culinary career began at Johnson & Wales University in Rhode Island, and has progressed through the most prestigious echelons of cuisine in the greater New York metropolitan area. Master Chef Latour honed his craft in some of New York’s finest hotels, including the honor of being part of the opening team at NYC’s Four Seasons Hotel. Master Chef Latour is specifically renowned for his mastery of French-American cuisine, the staple of his restaurant, Latour. Opened in 1998 in Ridgewood, NJ, Latour has been praised by patrons and critics alike for every aspect of its cuisine. Latour’s latest Zagat rating offers an auspicious 26/30 rating for food and notes its “showstopping” cuisine and “lovely…Gallic setting”. Peter Salerno Inc. is an Authorized Dealer of all La Cornue & Top Brewer Products. Their showroom features the Château 120, the CornuFé 110, the CornuFé 1908, and the Flamberge Rôtisserie. In addition, the showroom is soon-to-be fitted with a fully functional Top Brewer. Peter Salerno, Inc. is also an authorized dealer of Habersham, Schaub, Amerock, & Waterstone products. Enjoy this exclusive video from Design Your Lifestyle and Peter Salerno Inc., and see for yourself how a master like Michael Latour can make magic with La Cornue products! August 2016 August 2016 Peter Salerno, Inc.
For an exquisite, luxury French kitchen, there simply is no match for La Cornue. Ever since Albert Dupuy invented the first La Cornue oven over a century ago, the company has stood at the forefront of cooking design, craftsmanship and innovation. As such, La Cornue has developed a reputation as one of its industry’s leaders, and one of the world’s most luxurious brand names in the world of kitchen design. It’s one thing to see still photography of La Cornue’s world-class kitchen ranges and rotisseries. It’s another to watch them in action, utilized by the hands of a renowned Master Chef like Michael Latour. Peter Salerno Inc., an authorized dealer of La Cornue ranges and rotisseries through Purcell Murray USA, is the most award-winning North American custom kitchen and bath design firm of the 21st century. Peter’s work has been featured in multiple publications of note. He is one of a handful of HGTV’s featured Kitchen and Bath Designers, and is the recipient of numerous design awards, including the prestigious 2012 Best Large Kitchen award from the National Kitchen & Bath Assocation (NKBA) . In total, Peter was honored with an unprecedented 23 NKBA awards from 1993-2013, a mark which sets him apart in the custom interior design industry. For more information about Peter Salerno Inc., please visit their official website. February 2015 February 2015 Peter Salerno, Inc.
Peter Salerno Inc. was proud to receive another national design award at the 2015 KBIS convention. This year, Peter accepted the national 2nd place award for Best Large Kitchen for his work in a beautiful kitchen for homeowners Tom and Julie Connors. So of course, Peter and his wife Tracy Salerno had to take Tom and Julie out to celebrate! And what better place to celebrate than one of Peter Salerno’s favorite restaurants, Latour in Ridgewood, NJ. You may remember executive chef Michael Latour’s stunning cooking video in Peter Salerno Inc.’s La Cornue showplace kitchen from late 2014 (click HERE to watch that amazing video). Champagne bottles were popped and toasted (and a delicious meal was enjoyed) as Tom and Julie celebrated their award-winning kitchen with Tracy and Peter Salerno! 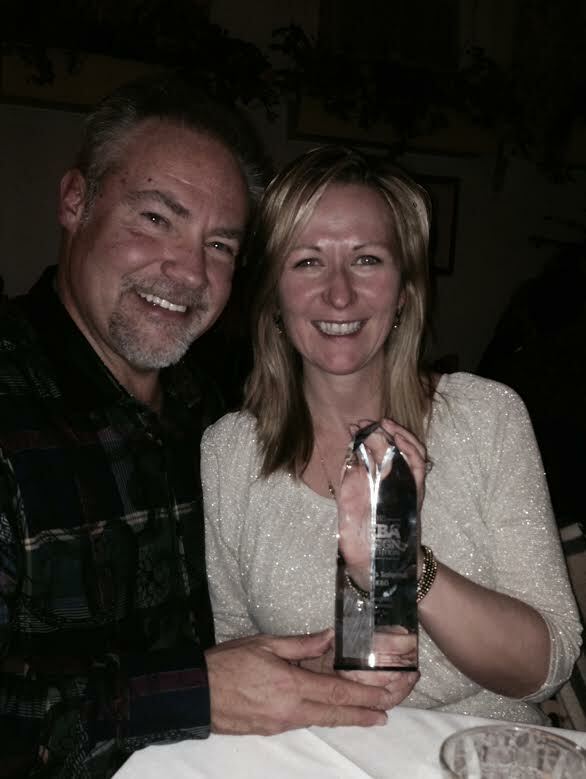 Peter Salerno Inc. clients Tom and Julie Connors, with their NKBA Best Large Kitchen national design award. In all, Peter Salerno Inc. has received 28 national design awards since 2002, from such outstanding industry names as the NKBA, KBIS, HGTV, and Signature Kitchens & Baths magazine. Peter Salerno’s showroom was also named Best Independent Small Showroom at the KBIS 2015 Innovative Showroom Awards. The nomination process was conducted by public vote, meaning this honor was awarded to the Peter Salerno Inc. showroom not only by industry professionals, but by the public as well. December 2013 December 2013 Peter Salerno, Inc.
Over the past several weeks, Peter Salerno Inc. has shared the La Cornue experience with all of you. Now, we are thrilled to show you exactly what La Cornue’s world-renowned cooking ranges and rotisseries can do, all thanks to the help of Master Chef Michael Latour. Michael Latour visited the Peter Salerno Inc. showroom at 511 Goffle Road in Wyckoff, NJ, to prepare an exquisite three-course French cuisine experience utilizing our showroom’s beautiful La Cornue Château 120 range and Flamberge Rôtisserie. The result was nothing short of spectacular: the finest in French cuisine prepared on the finest in French cooking appliances. CLICK HERE TO FOLLOW PETER SALERNO INC. ON TWITTER!! Please enjoy the video below, and continue reading for more information on every aspect of this once-in-a-lifetime experience. The Château 120 range features two patented La Cornue vaulted ovens, one gas and one electric, to meet the diverse needs of any chef in any circumstance. While our cooktop features its own configuration, your Château 120 range may be customized in any one of nine different configurations. The Château series features almost limitless combinations of cooktops, sizes, colors and accent/trim colors. Our particular Château is the Château 120 range in French blue, which provides not only world-class cooking amenities but a striking addition to the Peter Salerno Inc. showroom. Also utilized by Master Chef Michael Latour in this special video presentation is the Flamberge Rôtisserie, an open-faced rotisserie unit set beneath a rear wall of cast iron. The evenness of the Flamberge Rôtisserie’s cooking configuration makes it the gold standard for spit roasting, roasting small game birds, vegetables, chicken or fish. The accompanying Maison La Cornue drip tray allows the chef to collect juices to accent the taste of accompanying side dishes or vegetable servings. Once again, the Peter Salerno Inc. showroom features the Flamberge Rôtisserie in stunning French Blue to match the eye-catching beauty of our Château 120 range. For more information about La Cornue and its world-class line of cooking ranges and appliances, visit the official La Cornue USA website. Michael Latour is an Internationally Certified Chef, and a member of the Society of Culinary Philanthropique, American Culinary Federation, International Chefs’ Association and the International Geneva Association. He is a member of the Societé Culinaire Philanthropique and is a recipient of the Gold Medal awarded by the Les Amis d’Escoffier Society Foundation for Best Sugar Work Piece in the 2010 International Hotel/Motel and Restaurant Show at the Jacob Javits Convention Center. For more information about Master Chef Michael Latour and his restaurant, Latour, please visit the restaurant’s official website. Peter Salerno, Inc. is family-run business stemming from three generations of artisans- not a franchise under a common name. We are committed to providing luxurious and functional spaces that compliment your lifestyle. We offer an exclusive collection of furniture and design. From custom made kitchens and baths, to innovative entertainment centers and elaborate wine cellars- our team strives to deliver a beautiful addition to your home. For more information about Peter Salerno Inc., please visit our official website.